A special four-pawed member of staff at Otara Library is helping young children boost their reading confidence. His name is Roo and the retired champion racing greyhound provides a safe, accepting and non-judgemental ear for young people as they practice their reading skills. makes him the perfect dog for the programme. The project is the brainchild of Senior Children and Youth Librarian Pritcilla Meikle, who was inspired to create a reading dog programme for her library after researching greyhounds as pets for her own family. "I came up with the idea after researching greyhounds as a breed of dog as our family was looking at adopting one, especially after all the greyhounds we had met were just such calm and laid-back characters – and really good looking too! 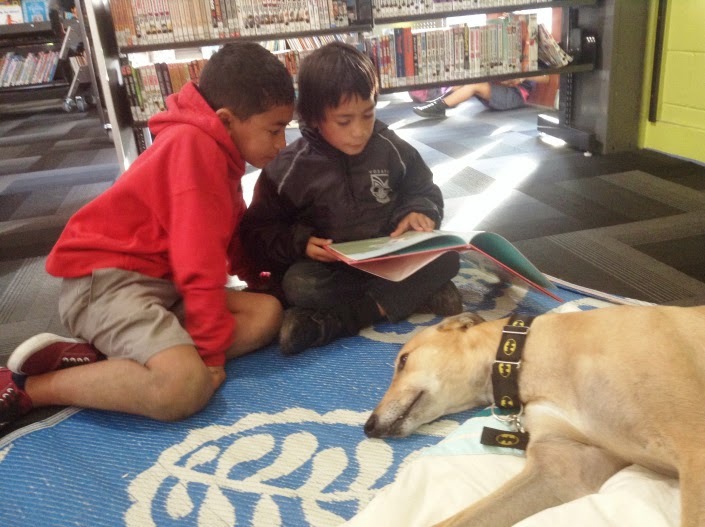 "I found that many greyhounds in the UK and the US were not only pets, but also ‘reading dogs’ – helping kids gain confidence in their own literacy skills and creating a positive relationship between communities and local libraries." As well as their calm, gentle “couch potato” manner, greyhounds also have a low shedding, low-allergy coat, and they are often used as therapy dogs here in New Zealand as well as overseas. Pritcilla and her family contacted rehoming charity Greyhounds as Pets to adopt the perfect pooch and were quickly matched with Roo. "Roo was specially selected to become our ‘reading dog’. He is a big, gorgeous, calm and gentle dog with a wonderful smile. Kids often mention his kind eyes and soft fur as a real highlight – they love that he ‘really listens’ and doesn't wander off. Roo is probably ‘the perfect dog’ as many people have described him: always happy to be admired but never demanding attention." encourages his younger brother Aukuso to read too. Since the programme’s inception in October 2013, Roo has been working at Otara Library three times a week for an hour each time, with children booking in to read to him in 15 minute sessions. Pritcilla said the programme is so popular, Roo is always fully booked with a mix of new children and regular faces attending. "Most of his readers are ‘repeat customers’ and every school term, new kids become Roo’s reading buddies, clamouring to make appointments and negotiating with others to squash in some time. "All reading sessions are fully booked, and we have had to limit bookings to one week at a time (unless it’s parents requesting a continuous spot to help their child with literacy – Roo has a few of these weekly appointments) otherwise no one else would get a turn." The one-year pilot project has shown immediate, tangible results. "Some of the coolest stuff has been seeing kids’ literacy improving – as they gain confidence, they start becoming real storytellers and narrators. Kids who are initially afraid of dogs gain such confidence and enjoy spending time with Roo. I love hearing feedback from parents about how their child has improved at school, how they read at home now, how they want to take out books and become library members" Pritcilla added. The Reading with Roo scheme is a perfect fit with Auckland Libraries’ 10-year planning document, Te Kauroa - Future Directions which includes a key focus on children. One of the plan's aims is to create and nurture readers and to make 'every child a reader, every child a library member'. "I started this project as a way of helping kids enjoy books, gain confidence in their own abilities and promote reading in our library in a unique and positive way. It was about doing something ‘good’ and I knew that the kids around here love being part of something special," Pritcilla said. Otara Library and Roo also featured on TV One's Seven Sharp programme on 4 June 2014. Update: Pritcilla and Roo have moved on from Otara Library and are sadly no longer available for reading sessions.